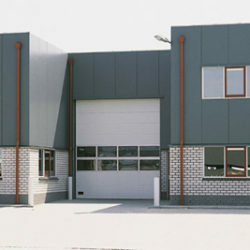 Due to their flexibility, they are the obvious choice for industrial buildings. They are installed with automatic or manual control, with glazing or entry door. They function perfectly, are of the highest quality, and are very durable. Sectional doors open upwards, thereby saving space in front of and behind the door. No valuable space is wasted in the hall because the door wing is parked under the ceiling, parallel to the roof. Due to the stop behind the opening, the entrance passage remains clear and can be fully utilized. Industrial doors come in all types and modifications (sectional and rolling doors, high speed roll-up doors, swinging doors, and PVC curtains). In order to create a complete loading place, the industrial doors can be complemented with hydraulic loading bridges and sealing collars. Our portfolio includes products from NOVOFERM, HÖRMANN and MINIROL. 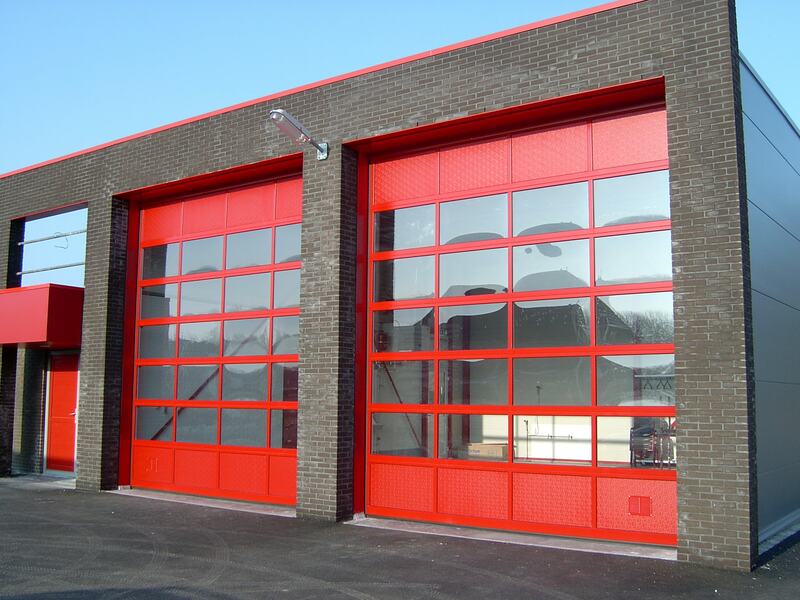 Novoferm industrial doors can be used in operational premises and come in various designs. 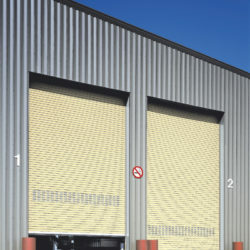 MINIROL INDUSTRIAL rolling doors provide a reliable and simple solution. 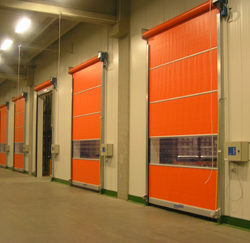 Novoferm high speed roll-up doors provide the optimal way to generate energy savings. Novoferm swinging doors are an even cheaper way of generating energy savings. Novoferm industrial curtains (strips) are the cheapest way of generating energy savings. They are used for both indoor and outdoor applications to optimize traffic flow, improve the environment and generate energy savings. Quick opening ensures the uninterrupted in-house flow of materials. 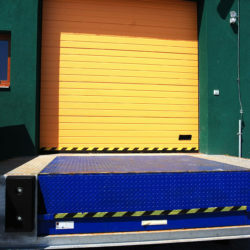 Hydraulic dock levellers with either a folding or retractable front are used to safely compensate for differences in height between the floor of a hall and that of the loading area of a truck, etc. They allow for the easy loading and offloading of goods without additional reloading. Sealing collars create a perfect seal between a truck and a building and provide excellent protection against energy losses and the weather. Depending on the type of seal, they can be supplied in either an aluminium or steel frame in blue or in black. Side mounted sealing flaps have white orientation marks to indicate the entry. Sealing collars with a compressible steel frame provide protection against draughts, the rain and wind. By using this collar you ensure a perfect seal between the truck and the building, thereby preventing heat loss, deterioration of the cargo, as well as the intrusion of birds or insects into the building. 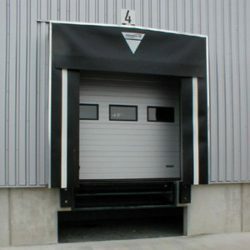 Industrial doors and loading technologies are manufactured in all types and modifications – sectional and rolling doors, high speed roll-up doors, swinging doors, as well as PVC curtains. In order to create a complete loading place, all the doors in our product portfolio can be complemented with hydraulic bridges and sealing collars.